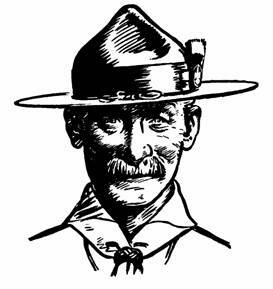 Baden-Powell's (B-P) book Rovering to Success, Rev. Ed., a handbook for British Rover Scouts, is an excellent source for understanding the goals and philosophies of Scouting as espoused by the founder of the movement himself after he had a chance to see the beginning of Scouting's maturation. In addressing his book to older Scouts, he went to some pains to explain the importance of religion to a Scout. The whole thing--the early voyage through the easy running stream, and then coming out on the broad lake, the arising of difficulties, the succession of waves and rocks only avoided by careful piloting, the triumph of overcoming the dangers, the successful sliding into a sheltered landing place, the happy campfire and the sleep of tired men at night--is just what a man goes through in life. 1 HORSES Gambling, lack of thrift, indolence, etc. 2 WINE Alcohol abuse, gluttony, foul language, etc. 4 CUCKOOS & HUMBUGS Demagoguery, snobbery, jingoism, etc. religion is essential to happiness. Nature knowledge is a step to realizing God." There are a good many men who have no religion, who don't believe in God; they are known as atheists. In Great Britain alone there are nine societies of these. They are welcome to have their own opinions in this line, but when they try, as they are always doing, to force these ideas on other people, they become enemies of the worst sort. This to every Christian who believed in his religion is an indecent insult. At the same time it is a direct call to him to action. But I am not going into that here. If you are really out to make your way to success -- i.e. happiness -- you must not only avoid being sucked in by irreligious humbugs, but you must have a religious basis to your life. Firstly: recognizing who and what is God. Secondly: making the best of the life that He has given one and doing what He wants of us. This is mainly doing something for other people. I can see how it might be possible for a man to look down upon earth and be an atheist, but I do not see how he can look up into the heavens by night and say there is no God. Seest thou not that all in the heavens and all on the earth serveth God; the sun, the moon, the stars, and the mountains and the trees and the beasts and many men. I love the homely beauty of the English countryside as I do the vast openness and freedom of the rolling veld in South Africa. I love the rushing waters and the nodding forests of Canada; but I have been more awed by the depths and heights of the Himalayas and by the grandeur of those eternal snows lifting their peaked heads high above the world, never defiled by the foot of man, but reaching of all things worldly the nearest to the Heavens." the mountains almost talk you into it. In the quiet of the night you listen to their voices; you are drawn into the brooding immensity all round you. In warm cities, where men huddle together, one must have something to cling to -- a personal Saviour, a lantern in a sure and kindly hand, comforting voices in the dark. But . . . there is a mystic purpose in Nature . . . Religion is essential to happiness. This is not a mere matter of going to church, knowing Bible history, or understanding theology. Religion . . . means recognising who and what is God, secondly, making the best of the life that He has given one and doing what He wants of us. This is mainly doing something for other people.